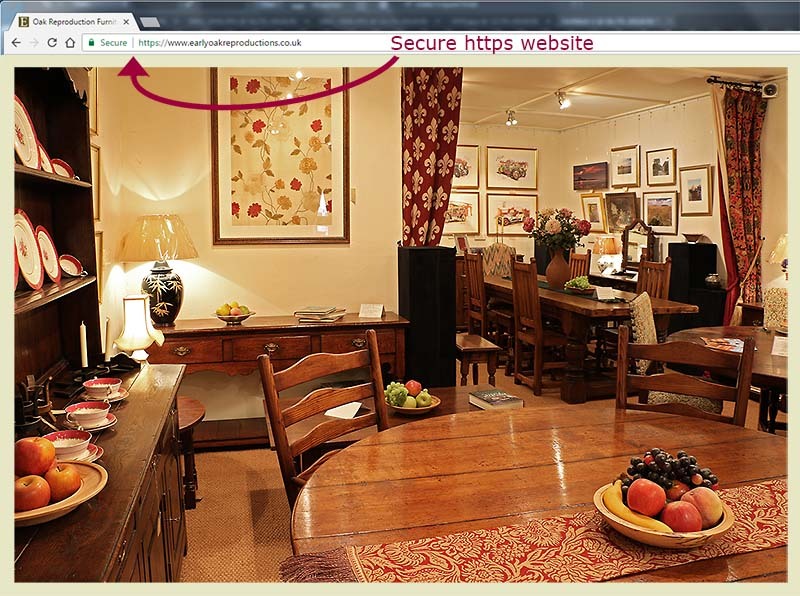 Early Oak Reproductions website is now a certified https (hypertext transfer protocol secure) secure site. That means any personal data you input, whether by registering your details, sending an email, or placing an online order, is encrypted. This makes it difficult for unauthorized people to view information travelling between computers. If you click the closed padlock next to the url in the web address bar of your browser (where the arrow points on the photo below), it will reveal more information, including the certificate details issued by GeoTrustInc. P.S. The photo shows a corner of our 1,000 sq.ft. showroom, packed with beautiful reproduction oak furniture, accessories and artwork. Two great reasons why so many, from all over the country (and beyond), trust us as their unrivaled specialists in this field.